If you have looked into making some extra money by taking paid surveys, it is likely you have heard of Panda Research. 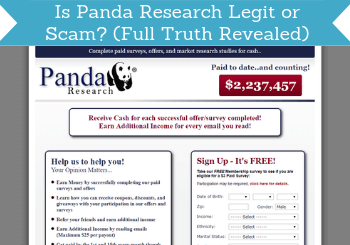 But is Panda Research legit or a scam survey site to stay away from? Let me reveal right away that there are different opinions about this. That is why I in this Panda Research review will give you all the info about what the site offers, what you can expect, the pros, and the cons, so you will know the truth and details before deciding to join or not. What is Panda Research and what does the site offer? Panda Research has existed since 2005 and the company A & A Marketing is behind it. At first sight, it looks like any legit survey site. As I will show you later, it does, however, have some warning signs, when you dig deeper. But let’s first look into what it offers, and how you can earn on the site. Panda Research is, first of all, a paid survey site, where you can get paid to share your opinion on various topics. It has a decent amount of surveys available and also for a decent pay in relation to the time spent compared to some other survey sites. However, there is a big warning sign when it comes to these surveys on Panda Research – they do not guarantee to pay you for the ones you complete according to there terms. A snippet of Panda Research’s terms. “PandaResearch does NOT guarantee that a member will receive credit for a completed survey and offer. PandaResearch will make reasonable efforts to track and report your signing up for offers but does not guarantee the precision of the process”. In the terms, it also says that the reason for this can among others be if there is fraud involved, inaccurate information etc. It is, of course, normal for any survey site not to credit for surveys or offers, if fraud has been involved or incorrect information has been given. So in that sense, it is not too alarming to have this in the terms. But when it mentions that they do not guarantee the precision of the tracking process, I become a little worried. When you put it together with the rest of the information about Panda Research I found, there is even more of a reason to worry in my opinion – but more about this later. Panda Research also offers you to take paid offers on the site. In fact, you already encounter these offers during the sign-up process. When you have given your email, and are about to give some more info, you get a preview of some of the offers the platform has. You get offers already in the sign-up process. During the sign-up, these are however not paid offers. It is offers Panda Research gets paid to promote, if you sign up for them. Offers can, in general, be great to take on survey sites, if you find the right ones. I do however not like when sites push these offers already in the sign-up process like Panda Research does. In addition to this many of the offers has nothing to do with surveys. One of the offers is for example for a free tax defense consultation – in my opinion, this is clearly just a way for Panda Research to make money by promoting the offers they get paid to because it is not really relevant for what most people sign up for. Also, be aware that if you sign up for any of the offers during the sign-up process, you NEED to read the terms and conditions. Offers like this are often not completely free unless you are willing to receive a lot of promotional material. Once you are a member, you will be able to find offers you can get paid to take. Again, just make sure to read the terms and conditions before taking any of them, so you are sure what you are getting into. You can also earn a little extra on Panda Research by reading emails sent to you from them. This will not give huge rewards but can give you some extra money. Be aware that you cannot rely only on this as the only way to earn. You can maximum have earnings from emails of $25 per payout. The rest has to be from the other earning methods (more about the payout options later). You can also earn by inviting friends to join Panda Research. If a friend you invite joins, you will get a commission of 10% of what they are earning. So if a friend earns $50, you will get $5. However, not for the paid emails, they read. This will not be taken from their account, but be paid by Panda Research as a thanks to you for inviting someone else. However, be aware that you will not get this money until your friend requests a payout. Also, make sure you really do recommend Panda Research before inviting anyone. If you invite someone to join, and they feel they end up wasting there time, it can potentially affect your friendship. So make sure to test the platform yourself, before inviting anyone else, and also make sure you know what you are getting into. So keep reading this review to get all these details, as there is a lot you need to know about Panda Research before joining. How you get paid is important on any survey site. I must say that here I am not too excited about Panda Research. It pays out in cash through PayPal, and I love PayPal survey sites, as it is such a great and easy way to get your money. This is the only payout method on Panda Research and that is in my opinion fine. BUT you cannot get paid until you have earned $50. This is a very high payout threshold compared to most other survey sites. 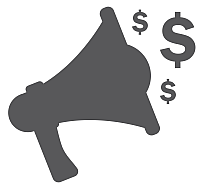 Some of the quickest paying sites pay out already when you have earned $1. So it will take some patience to reach the threshold on Panda Research compared to most other sites. In addition to this, there are many complaints about not being able to get your money, once you reached the threshold – but more about these complaints a little later. Let me be honest with you – you should not expect to earn a lot of money on Panda Research. It can be a way to make a little extra cash, but even with the $3 joining bonus you get, it can take you a long time to get to the very high payout threshold with the amount of opportunities the site offers. Also, before deciding to try to reach the threshold, you have to read the section later about the complaints about Panda Research, as this is something you need to know before investing any time. I always include a section about how easy a survey site is to use on mobile devices, as it is such an easy way to take surveys, when it fits into your schedule. Even though the Panda Research website looks very old and has an out-of-date look, it is actually optimized for mobile, and works fairly well here. So if you decide to join Panda Research, it is possible to use the site on mobile. 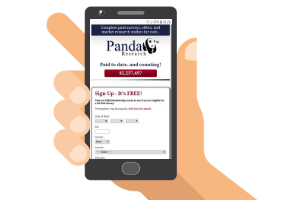 Be aware that if you use you mobile device to confirm the paid emails from Panda Research, you will not be paid for them. They only credit you, if you open these mails on a desktop. You can only join Panda Research, if you are at least 18 years old and live in the USA. With so many great survey sites in the USA, you should however consider looking into many other survey sites before spending any time on Panda Research in my opinion. If you do not live in the US, do not worry too much about that – you can instead check out the list of the best sites in your country here. Most of them will give better opportunities than Panda Research anyways in my experience. One of the first times I heard about Panda Research was from one of the visitors here on PaidFromSurveys.com, who was frustrated about losing money on Panda Research. There will almost always be some complaints about any survey site, as we all go into it with different expectations and sometimes we are unlucky and have a bad experience, while others are luckier. But this comment still worried me – take a look for yourself. A complaint about Panda Research I received on my website. As you can see, this person had $240 in the account and could not get the money out. So I decided to look deeper into it and make this review myself. In this process, I have also looked to see, if there are other similar negative Panda Research reviews. I was actually not able to find any really positive reviews of the site. Most reviews and complaints are about not being able to get the money out. Here is another example of a complaint I found. Another example of a complaint. This person has waited more than two years to get money from Panda Research. As mentioned, there will be complaints about more or less any company and service. But in the case of Panda Research, there is an overwhelming number from what I found. Combined with my own experience from looking into the site, this gives a lot of warning signs. Panda Research is seemingly a site, where you can earn some extra cash. At the same time, it does, however, have a number of warning signs. So let’s sum up the pros and cons, so you can get a better overview, before deciding to join or not. At first sight, Panda Research looks like a legit site, where you can earn some extra cash. It does however have some annoying offers already in the sign-up process, and there are A LOT of complaints from people that say they have not been paid from it. If it then had a low payout threshold, so it was quick to check, if you would really get paid, there would not be much of a risk. But it can take a while to get to the threshold, and you can end up wasting a lot of time, if you end up not getting paid. Therefore, when I put all this together, I must say that Panda Research in my opinion simply is too risky to join and spend time on. There are so many great survey sites with more earning opportunities, lower payout threshold, and better reputation, so why take the risk? If you have any comments, questions, or have any experiences with Panda Research yourself, I would love to hear from you in a comment below. You can earn by taking surveys and more on Panda Research. It, however, has a very high payout threshold, and combined with numerous other warning signs, like many complaints from people not getting paid, it is in my opinion risky to spend too much time on this site when there are so many other great survey sites.